“Tools of the Trade” and “Right Tool for the Job” are sayings in many cultures because doing a job right the first time depends on having reliable tools at hand. Give any carpenter a plastic child’s hammer, and they would struggle to put up shelving just as much as you would. When it comes to cooking and preparing food, having a good knife or two makes a world of difference. Just like you don’t need to be a professional skier to appreciate the difference between a cheap, generic all purpose ski and a good, basic but well designed ski. Before you can appreciate a good tool, however, you need to know a few basic guidelines. Just like any tool, knowing some basic tricks makes using knives much easier and safer, meaning you’re much more likely to get cooking in the kitchen! Pinch it like a pro! Hold the knife blade between your first finger and thumb (like in the image) for the best control over the blade. The Claw hand for holding. Notice in the image on the right how the tips of their fingers are held in? Don’t let the hand holding the food splay out, keep everything tucked in, like a claw. Always try for a flat surface. Rolling vegetables are common causes of slipped knives and cut fingers. When possible, cut the vegetable in half so that you can put the flat side down. Sharper is safer. If you’re working with a dull knife, it’s much more likely to slip when you try to force it to cut. You should be able to let the weight of a sharp knife do most of the work. Secure your cutting board. If you don’t have grips on the corners of your board, a damp dishcloth underneath works just fine. Consider starting with a block set if you don’t have good knives now. If you’re just getting started with a new line of knives, I will suggest you consider starting with a block set. The price can’t be beat, and there’s extra room in the block to fit in knives that suit your home (extra prep knives for vegetables, for instance). If nothing else, start with a good chef’s knife. You’ll be able to use this to do just about everything, and it won’t be easily damaged like some slimmer knives. The heavy blade can cut through most anything, although you might find it awkward for small tasks and large slicing tasks. For the smaller, more detailed tasks, like cutting a pepper, it’s easier when you have a smaller, more nimble knife. As these tend to get lost, consider having a selection of less expensive knives. As long as they’re sharp, they work great. Higher end paring knives will feel better in the hand, and last much longer, but that doesn’t help if your roommate keeps tossing them out with the compost. For the rest of your selection, consider what you like to cook the most. Commonly, a longer bread knife, a slicing knife, and a honing steel are included in block sets to get you started. Santoku knives typically have a Granton, or hollow edge that helps reduce friction and are popular chopping knives. Filet and boning knives are key tools if you deal with a lot of fish or meat chunks. Consider who, other than the main “chef of the house”, likes to have help in the kitchen. If the man of the house only ever buys large knives, then he can’t be surprised when his “little” lady doesn’t want to help. The opposite is true; if you want the larger dad to help, he might need a larger chef’s knife to feel comfortable with. Children and teenagers will also feel more comfortable (and be safer) with smaller, lighter knives. Now, on to the knives! 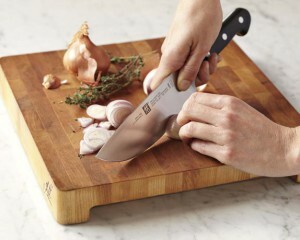 Zwilling makes several lines of forged german knives, but we only have so much space in the store. I’ve chosen my favourite for our forged steel line, the Zwilling Pro. Designed in consultation with chefs to keep the traditional style, but with a much more functional selection of shapes. These are the knives I’m saving my nickels for! Perhaps you prefer a lighter knife and a more traditional bolster. The Four Star line has been around for over 40 years and is part of what built the Zwilling brand. Forged german steel has the strength to last years in your kitchen, and the balance is a little lighter than the Pro. Live with some roomates that you just don’t trust? Hide your knives, or save some cash and invest in the KolorID line, designed for commercial kitchens. A sturdy grip, great steel and affordable price make this a great entry-level choice without sacrificing quality. Buying a knife is a personal experience. Touch and feel is key, as the balance of each knife is slightly different. We are happy to offer these three lines of knives to Revelstoke and the surrounding area, and keep a full selection in stock so that you can handle the different chef knives to find the best fit for you. Please ask if you’d like to take them out of the cases, we are happy to help. This entry was posted in Buying Guides, Learn. Bookmark the permalink.